From romaine lettuce to Swiss chard to collard greens, leafy green plants are packed with nutrients. Several plant families contribute to leafy greens, including the daisy family and the cabbage family. Leafy greens, considered vegetables, are available in produce sections in supermarkets, though you can grow them in your garden. Leafy greens are seasonal, and due to the wide variety, you can grow leafy greens from early spring into the late fall. The leafy lettuces grow upward from a core but do not form heads. Instead, their leaves grow up and fall slightly away from the “heart” of the plant. The heart is at the center and consists of tightly wrapped, smaller leaves. Leafy green lettuces include romaine lettuce, bib, buttercrunch and micro-greens or baby greens. Leafy green lettuces are cool weather crops. Sow them in early spring or late summer and harvest leaves as needed. Some greens have a bitter taste and need cooking to remove the compounds that produce that bitterness. Spinach, though, is edible both raw and cooked. Baby spinach, which is spinach picked before maturity, is milder than mature spinach leaves. When cooked, spinach shrinks. One pound of cooked spinach reduces down to a weight of a few ounces. Spinach is a cool weather crop. Sow the seeds in early fall and harvest as needed. Spinach may continue to produce for a short time after the first frost. Also known as spinach beet or sea kale, Swiss chard grows large, veined leaves that flesh outward from a thick stalk. The leaves are a source of vitamin K and other nutrients. Remove the leaves to cook, as the stems require a longer cooking time. 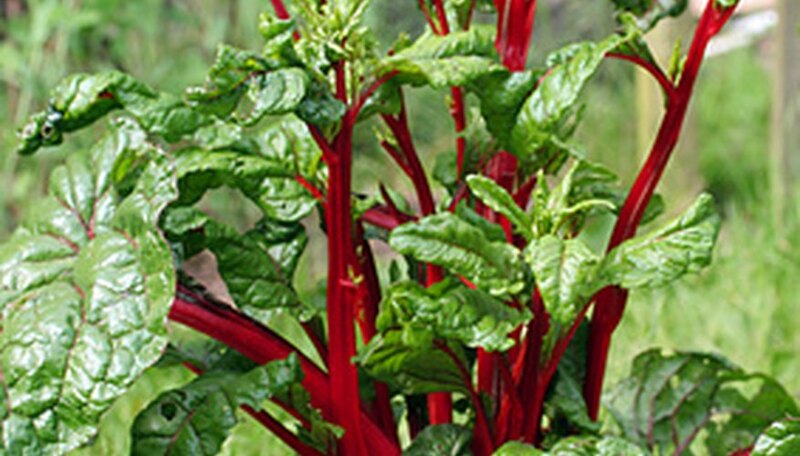 Sow Swiss chard seeds in late winter just after the last frost. This leafy green grows well in the last weeks of winter and into early spring. Harvest leaves as needed and use within a few days. Swiss chard tends toward bitterness and wilt if stored too long. Collard greens and kale are both members of the mustard family and are packed with nutrients. These greens are commonly cooked together along with ham hocks, bacon or turnips. Sow collard greens or kale seeds in early spring and again in late summer. Both these greens will tolerate some heat but will go to seed by mid summer if not harvested. They also tolerate cooler temperatures and may produce up until the last frost.